* Large inside work area to assist work piece loading and unloading. And oversized Column Bottom also provides maximum support. 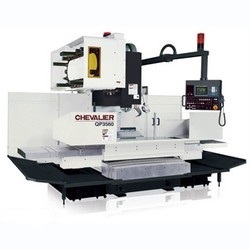 * The machine is constructed of high quality Meehanite cast iron, heat treated for deformation-free performance. * Three axes slide ways are coated with Turcite B to ensure extremely smooth traverse and minimum wear on slide ways. * Table and saddle are fully supported through the entire stroke without overhang problem. * High precision class C3 ball screws on X,Y,Z axes.